Littleton Painter has traveled to Italy a number of times to connect with her Italian heritage, but last summer in Cortona, the picture-book village made famous by writer Frances Mayes (“Under the TUSCAN Sun,” et. ), she really felt she had come home. “They greeted me, loved me, took me in,” she said. When it came to return to Littleton, her friend Emilio agreed to store some of her summer paintings in his cantina until she returns next year to exhibit them. highlight. She arrived with her young daughter Antonia with some sadness in her baggage: it was the 20th anni-versary of her mother’s death and her aunt (Mia Zia) who was very close to her had suffered a cerebral hemorrhage. 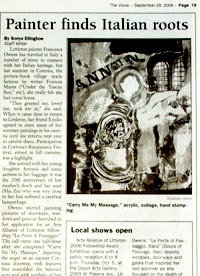 Owens started painting pictures of doorways, windows and gates as described in her application for an Arts Alliance of Littleton fellowship, “Le Porte di Passaggio.” The call came one half hour after she completed “Carry Me My Message,” depicting the angel on an ancient Cortona doorway, with features that resembled the beloved aunt and with symbols of her late mother, “a tribute to the wonderful matriarchs who shaped my life.” She expects to apply for Italian citizenship next year and to enroll Antonia in first grade. She has invitations to participate two exhibitions with an Etruscan theme and was able to tour newly-excavated tombs. “I have all these ideas cooking in my head” she said with a big grin. Five pieces in the Italian series will be included in the AAL show that opens Thursday, Oct. 5th, at the Depot Arts Center Owens was invited to participate in: Beyond DaVinci,” a collection of works by Italian American artists (though not necessarily pictures of Italy), which will open with a reception Saturday, Oct. 7. Owens, who is an active environmentalist, has a particular interest in saving the tigers which are headed for extinction. She will exhibit two big paintings of tigers, which have become a trademark in her distinctive style. She calls that series “Did I Die in Vain?” and is working to get a traveling educational exhibition. She has sponsors in place and says she needs $3,000 to $5,000. She has approached several galleries about hosting shows. She hopes the final products can serve as a model for other artists who want to make an environmental statement.